Burj Khalifa fame architect Adrian Smith was born on August 19, 1944 in Chicago, Illinois. He graduated in 1969 from the University of Illinois, Chicago and was awarded an Honorary Doctorate of Letters Degree by Texas A&M University in 2013. In 1960s Smith started working at a firm SOM as a young architect. He started designing Burj Khalifa while he was still attached with that firm. The firm SOM was famous for producing corporate projects mostly but Burj Khalifa was an exception. Smith got retirement from the firm three years earlier than the official time and took a ten years lease on an office and gathered a number of colleagues to work with and began another phase of his career. Smith has great interest in making tall buildings and remarks that such buildings act as landmarks and leave a great influence on their surroundings. The name of the firm set up by Adrian Smith is Adrian Smith + Gordon Gill Architecture (AS+GG) which focuses majorly on providing a platform to work for high-performance, energy-efficient and sustainable buildings on international level. Smith has great passion for the use of vernacular and indigenous forms and compositions and this can be seen in his work as well. With evolution in the world of technology he is up to the integration of regional techniques and industrial methods for his designs. He focuses majorly on the physical features of each of his design. Since the major goal for all of his projects is to achieve the environmental sustainability so he puts so much attention to location, climate, geographical, geological, cultural, and social influences of site. During the course of some recent years he has adopted a new design approach of producing energy “on site”. In order to make sustainable buildings with less energy and more efficiency he designs buildings in such a way that they absorb more and more energy from natural resources including sunlight, wind and geothermal conditions thus producing energy for projects on the respective sites. This not only aids the energy but also lessens the dependency of buildings on the local infrastructure. Smith’s this technique has opened up new dimensions in the field of architecture and led to the proposal of new philosophy in architectural world called Global Contextualism. Smith has always had great interest in international projects and very actively took part in all the development programs he could get his hands on. He has been a keynote speaker at the ABN Amro symposium (1990); the Ouaternario conference in Singapore (1991); the Council on Tall Buildings and Urban Habitat (CTBUH) Fifth World Congress (1995); CTBUH World Congress Dubai (2009); CTBUH World Congress Chicago (2011); CTBUH World Congress Shanghai (2012); and has also lectured in Frankfurt, London, Buenos Aires, Notre Dame, Amsterdam, Prague, Hong Kong, Shanghai, Seoul, New York, Chicago and Washington DC among other locations. 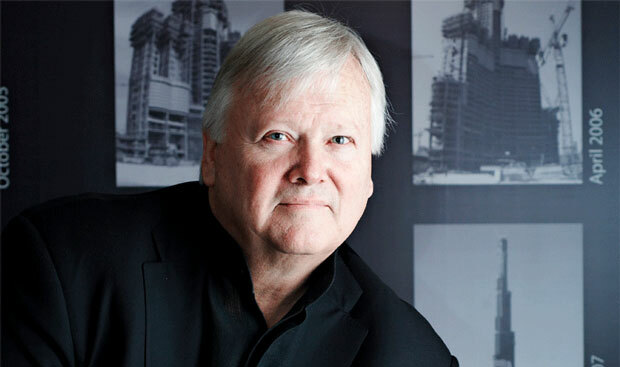 Adrian Smith has been a registered architect in twelve states of the USA and his designs have won him more than 125 awards which include 5 international, 9 national and 3 Urban Land Institute Awards for excellence. He is making most of his time working on his projects with a lot of dedication and unstoppable energy.